Spray skillet with cooking spray like Pam. Place diced bananas into skillet, sauté for approximately one minute. Add a little Amaretto, don't worry too much about calories, because it burns off, but don't go overboard. 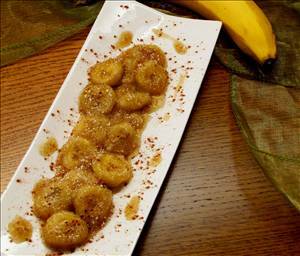 Sprinkle a little sweetener, (like Splenda) on top while cooking to caramelize the bananas. Voila! All done. Pairs nicely over sugar-free, fat-free vanilla ice cream. I need to try this for dessert it sounds good and it is about 1 1/2 pts on ww. There are 176 calories in 1 serving of Bananas Foster. Calorie break-down: 3% fat, 93% carbs, 4% protein.